When I read about the chocobo food all I thought was "oh dear here I we go again". Let the speculation and testing begin! I am somewhat worried about the food being obtainable by gardening though. 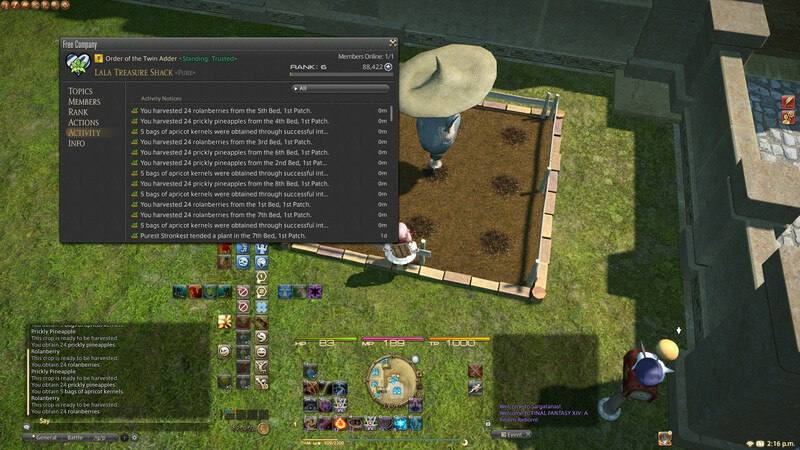 So far everything that was produced by gardening belonged to the FC. Our jute/broombush/glazenuts have been used to produce minions and furniture, and all the other fruits and veggies are stored in the FC chest and are free to take if you need them. But I imagine chocobo foods will be a lot more popular than our entire fruit supply. I imagine supply is going to be very limited at first but that it'll become less of a problem once personal houses are released in 2.3.8 and everyone can have their own garden. Been spending a lot of time this week stocking up on Grade 3s and working on acquiring/ranking up more FCs (for gardens!) for the patch. Really excited to see the different kinds of chocobo feed and new housing stuff. Last edited by YunieAura; 07-04-2014 at 08:23 PM. Skimmed quickly for gardening stuff to try and put it in one place. Lemme know if I missed anything. Last edited by YunieAura; 07-05-2014 at 12:40 AM. "New items have been added to residential area vendors." Krakka Root doesn't give our chocobos any beneficial effects when used for summoning so it looks like it's just there to be a cheap and easy-to-obtain option to help people who just want to level their birds and man that makes me happy. Thanks FJerome! I had some time so I edited my post with the thing you pointed out. to follow along with the Patch 2.3 Gardening discussion. Last edited by YunieAura; 07-05-2014 at 01:41 AM. A little update re: shroud soil success. Last I posted I was at 2 successful (+5 seeds) of 8 plots, but it evened out over time. Currently at 10 out of 16 successful plot, with this crazy (but definitely outlier) result of 20 seeds from a single plot. I won't be able to plant a Glazenut plot before 2.3 hits though, all plots in use, so I guess I won't be able to see how that turns out, until it's confirmed either way that they are/aren't fixing the loops. Last edited by hqdm; 07-05-2014 at 02:26 PM. Not sure. If we are lucky the existing chains and loops aren't changed. I planted a cycle of Broombush/Almonds this weekend to test whether the loops (or at least that loop) are changed by the patch. Under "Confirmed Crosses", the spreadsheet lists Halone Gerbera + Almond two times, but with two different seed outcomes. H.G. + Almond = Broombush seeds. It does NOT produce Jute seeds like the spreadsheet says. The spreadsheet maintainer hasn't corrected this in quite awhile and doesn't accept comments/corrections through the submission form. The spreadsheet has been updated to reflect this error. Comments are also open to the public (meaning anybody can leave a comment on the spreadsheet). You can also edit your own form submission as needed. These have been features available since the creation of the spreadsheet.